Photos from Strike Camp 2012: While the CPS teachers were on strike, we built our "school" together. We explored how our minds work. We investigated experientially through activities like meditation and yoga. We investigated inquisitively by learning about neuroscience. We investigated imaginatively though group story projects and games. Friday April 1 : SOLD OUT!! If CPS teachers strike on April 1, NeruoKitchen will offer a one day Curiosity Club camp. The day will include science + art investigation and play. Everything will be adaptable to the age range of the kids attending. The Curiosity Club is now its its 6th year. Take a look at prior Curiosity Club workshops. The main idea is to cultivate curiosity as an essential ingredient for a life-long love of learning. We explore physically, imaginatively and intellectually. Kids are encouraged to take initiative, given the freedom to investigate independently, invited to work collaboratively, and challenged to do things they've never done before. 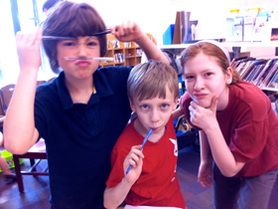 Summer camp at the Curiosity Club delves into a theme to explore with art and science. 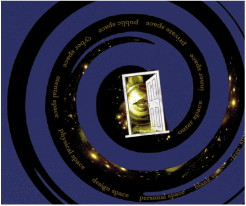 This summer our theme is SPACE. We will play with outer space, inner space, personal space, public space, cyber space, blank space . . .
Each summer the kids also make movies. Find out more about summer Curiosity Club and watch the kids' movies. Founder and teaching artist Anita Evans has been working with kids since she babysat for two-year old identical twins at the age of 12. Since then she lots of experience working with many kids, including kids with diagnosed behavioral and learning difficulties. In addition to working with elementary school kids, she has been experience creating with teens since 1995, currently teaches preschool at a co-op, and recently became a Certified Yoga Teacher.